Everybody wants subways in Toronto and beyond. With so much of our focus on the debate over whether Scarborough is best served by a one-stop extension, York Region Transit has launched a new PR campaign in support of extending the Yonge Line into Richmond Hill. Called "Yonge Subway Now," the campaign comes with an informative website that lays out the case for the extension. It's rather good timing for such a PR move. As politicians discuss woefully low ridership numbers on the proposed Scarborough extension, York Region can boast that a Yonge Extension could garner 165,000 riders a day. Much of that would come from riders along the Toronto portion of the route (from Steeles to Finch), but that only works to suburban transit provider's advantage. The provincial government has allotted $55 million to planning and design of the Yonge extension, which would stretch 7.4 kilometres and connect Finch Station with Highway 7 via five new stops at a cost of approximately $4 billion. 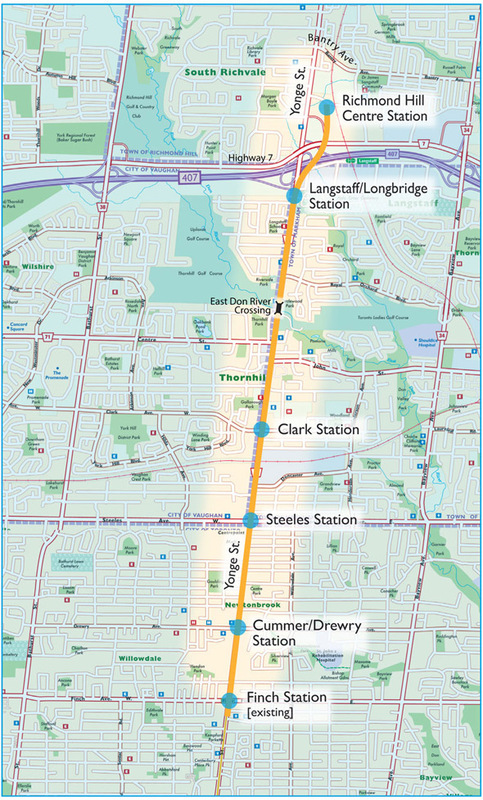 The proposed stops would be Cummer/Drewry, Steeles, Clark, Langstaff/Longbridge, and Richmond Hill Centre. There is, however, a major catch to all this. With major concerns pertaining to crowding on the Yonge Line, Toronto doesn't think a northern extension should be undertaken until a Relief Line is built. The earliest it seems that's going to happen is 2031, and that's assuming that the city can get its act together and secure funding for the $6.8 billion project. So, while everything about the Richmond Hill extension looks good when removed from the wider context of transit needs across the Toronto region, it's a fair bit more complicated when you take a holistic view.